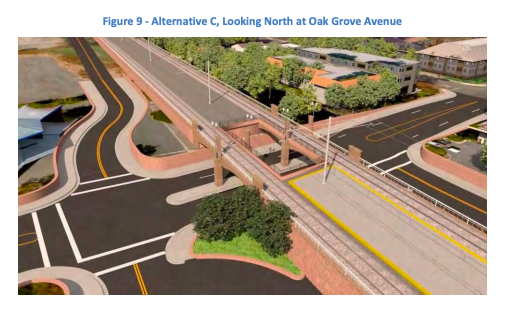 Tonight: the Menlo Park City Council, with three newly elected members, reversed its previous preference regarding how to grade-separate the Caltrain tracks from local streets. The previous council had decided last year to favor an option separating only one street, Ravenswood, with an underpass. Tonight January 15, in a study session, the four council members who were present preferred to separate three streets (Ravenswood, Oak Grove and Glenwood) with a hybrid/berm, similar to the design in Belmont/San Carlos. Mayor Mueller was out of town and not present, as his father had very recently passed away. The council members present all favored the hybrid/berm option as their top choice. Some still wanted to continue studying a fully elevated viaduct, a design which is strongly supported and similarly strongly opposed by sets of residents. Council Member Combs also wanted to keep studying trench and tunnel options, although he was skeptical of their financial feasibility. 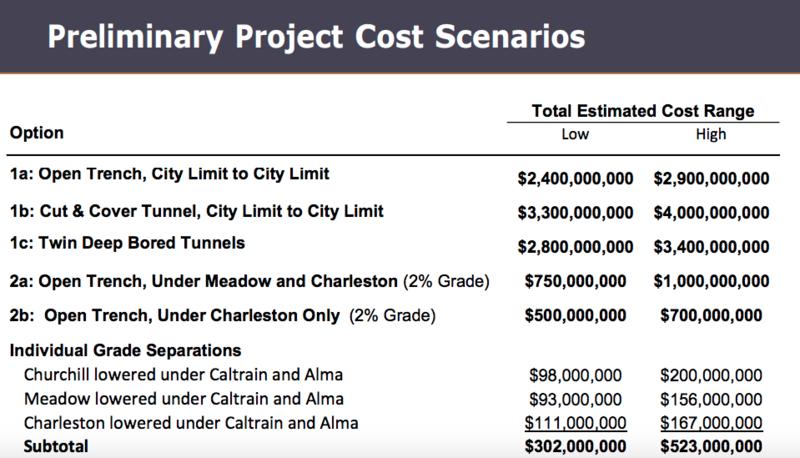 Mayor Mueller is on record as continuing to favor [update: studying] a tunnel, though it ls likely to cost $1-2 Billion or more, based on earlier estimates inÂ Palo Alto and other corridor cities. Update: Council Member Mueller clarifies that he is interested in exploring a partnership with nearby cities about the possibility of a multi-city tunnel, and wants to see this assessment take place in a matter of months. 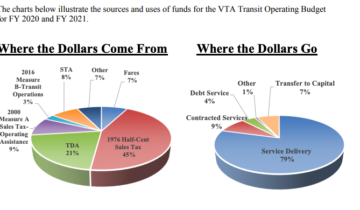 There is no evidence that state/regional sources will be willing to pay extra, for a more expensive project versionÂ that provides no additional transportation value, and whose value is toÂ hide the train from public view. Instead, the additional funding would logically need to come from local sources; and there is no evidence that the community has the appetite for thousands of additional annual dollars in local property taxes to support bonds for such a large project, plus large developments at the scale planned in San Francisco and San Jose, creating millions of square feet of office and thousands of homes, in 20-40+ story towers, to contribute local funds for a tunnel and underground station. Update: these funding mechanisms were mentioned in Palo Alto’s earlier financial assessmentÂ and the San Francisco and San Jose cases are reported on here. For disclosure, your blogger mentioned these funding concerns in public comment. Tonight’s meetingÂ was a study session, meaning that Council gave direction but did not take a vote. Following the Council’s direction tonight, the staff and consultants will come back in February with options for council to vote on; including going ahead with the hybrid/berm as the new preferred alternative, continuing to carry forward a Ravenswood underpass alternative for comparison, and optional additional choices for Council to keep on studying viaduct and trench/tunnel options. I don’t see much consideration for additional tracks here! Are they considering an island platform? Might not be bad if the “island” is designed wide enough for 2 extra tracks to be added in the future. And space remains on the side for side platforms. They were required to â€œnot precludeâ€ a future 3rd track as part of the planning funding, so the consultant report said it could be added on the east side later, but that seems less than practical. The official Menlo Park position is opposition to more than 2 tracks anywhere in MP.